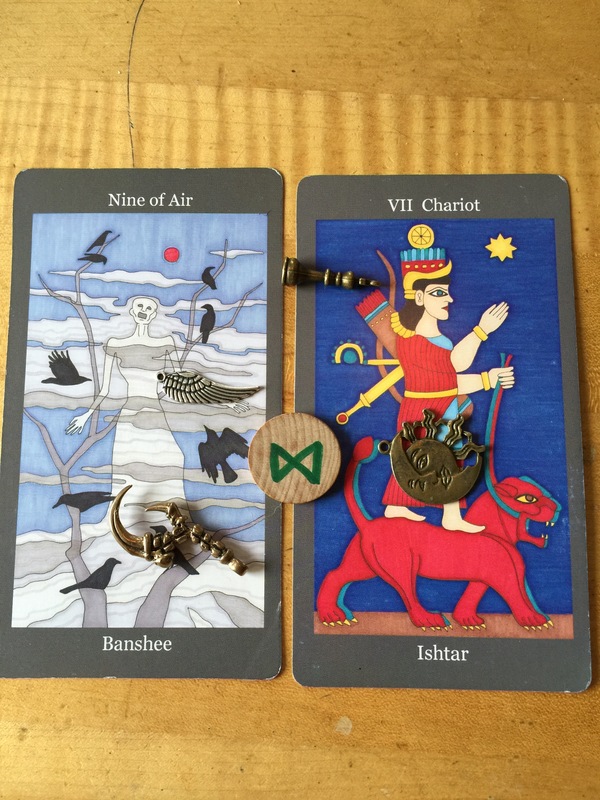 Today’s draw is about the path of the Hermit, about self-care and what to do to make it happen. Carve out time for yourself today, my dears. Go with the creative flow, however that manifests for you: painting, writing, building, sewing, or even just self-pampering. There is value in taking good care of yourself, and following the wisdom of others who know how to do that is a good idea. Watch out for the sturm-und-drang that comes from the outside world. Most of the time we can’t do anything about what comes at us from social media: the firestorms, the politics, the terrible events that happen outside the borders of the cities and towns we live in. It’s like checking WebMD when you have a headache and freaking out because of all the horrible diseases that can cause headaches (when you probably are just dehydrated). Don’t let yourself get spun out by the craziness of the world around you. Stay focused on the tasks at hand, and let the world do its thing. There are Forces at work in the world right now that have nothing to do with you, and while you may sense Their presence, They aren’t aiming Their work at you. Tend your own garden today. 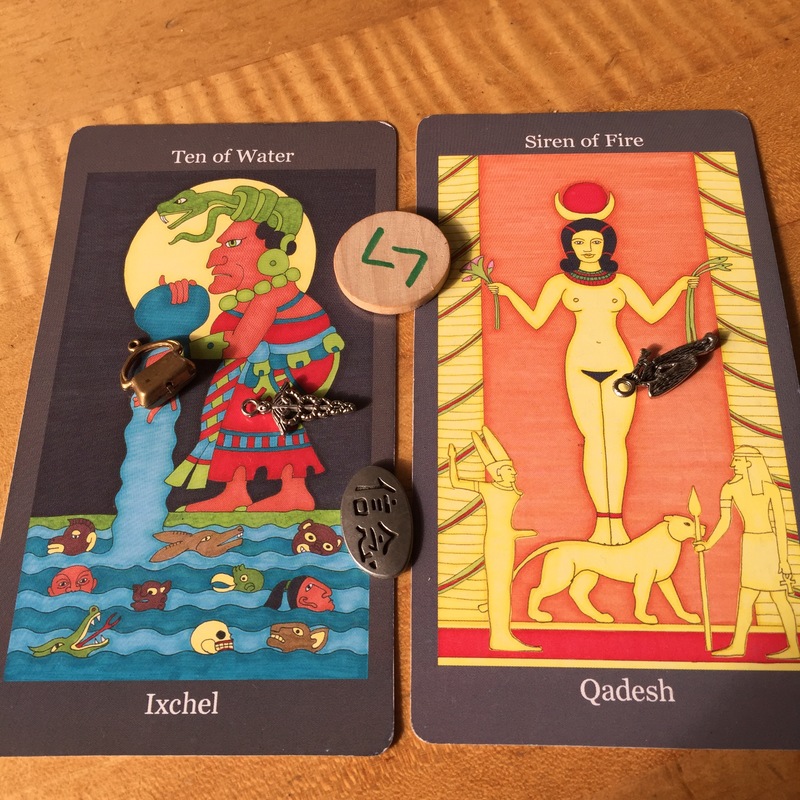 Today’s reading is a warning to let go of past anxieties and freak-outs. Day has dawned and it’s time to move forward, so don’t let the night terrors shadow your day. You have a great deal of work to do, and you can’t do it if you’re still enmeshed in the fears you had before. Let go. Face forward. Make a concerted effort to find the claws that still entangle you, and detach them all. Give them over to whatever gods you worship, then leave them behind and move on in strength and power. So that’s three times in a week that La Llorona has made an appearance, and in this case, She is representing that which we mustn’t give in to. Put on your disguises, your masks, and let the great grief of the nation pass you by. There is so much sorrow and grief in the world right now that it’s getting in the way of everything else. It’s time to disconnect from it. Turn off the media, grieve in your own private way, and do what you need to do to shield yourself. Focus inward. Take good care of yourself today, and let the anonymous nature of the priesthood envelop you. Go deep into your own pathways and stay steady while the greater grief flows by. Today is a day for making magic to help us let go of what is dead. Right now we are going through a period of terrible violence and shadow as evil forces struggle to retain their ghastly grip. Don’t be taken in. Keep yourself as grounded in peace and love as you can, and do whatever you need to do to release drama. Take a break from social media if that will help, or create something today, even if it’s as simple as scribbles on a napkin on your lunch break. Give yourself space and time to breathe, and do your best to take care of yourself, especially if others are counting on you. Put on your own mask first. Relax into beauty and peace wherever you are right now, and release what is dead. Visualize yourself letting it go into the grave, and leave it there. Turn around, walk away, and move on in peace. The sadness keeps coming up. Perhaps it’s because here in the northern hemisphere we’re in the dark half of the year now, the more contemplative half, that old sorrows and regrets are surfacing; perhaps we see unfairness more now than we did when we were younger. We started out so fresh and committed, so pure in thought and expectation, but injustice happened. Life happened, and now grief is the result. The devil has infected our joy. We are no longer the passionate voices of spring singing the songs of justice for all and a world reborn. We are tired, storm-tossed, grief-stricken, and overwhelmed by the human heart’s capacity for depravity and just plain meanness. The human-led structures of the world are no longer good — if they ever were in the first place — and now we can see it whereas before we were blinded by idealism. So the lesson for today is simply this: acknowledge whatever grief and regret you feel for not meeting whatever goals you set for yourself when you were younger, and forgive the world for letting you down. Change will come from within after that, but first we all must face the consequences of joy thwarted and dreams diverted into inaction. But remember this: keep moving. Don’t set up shop in this “grief and regret” place. Acknowledge it, recognize it for what it is, learn from it if you can, and then move on with greater wisdom and understanding. Today’s draw calls for an end to grieving. What grief have you been carrying for too long? Here’s the thing: it’s affecting everything else. It’s time to let it go. Look at how you wanted things to be, feel the emotions associated with that, then let it go. The present moment is what it is, and there’s no way to bring back the past. Past mistakes are done and there’s no way to undo them. Take a moment today and ask for protection from this overwhelming grief at what happened (or what didn’t happen). Instead of letting that flood of grief overwhelm everything, stop it in its tracks and direct it downward into the Earth. Let it flow into the arms of the Mother who accepts and transforms everything, and then recommit yourself to focusing forward. Leave the past behind, and forgive yourself for your mistakes. Focus forward, my darlings: that’s where the magic is.